Some photos from the past week-ish. One of things about staging a house that bums me out is doing away with personal choices. Apparently Ralph Lauren's Hunting Coat Red is a bit much for some people. So, goodbye red. Hello beige, er, I mean Navajo White. A quick visit to biggest's Science class. Experimenting with pH. Nothing melted + nothing exploded = a good day. There used to be a very ugly medicine cabinet in that hole. And a very ugly light fixture above it. In a very ugly yellow bathroom. That's all gone now. We also made some time to goof off and eat at Cheeburger Cheeburger. Funny that we missed In-N-Out so much when we moved here. And now, we'll miss Cheeburger. Making Michael Ruhlman's lemon bars. When I read that post the very first time, Ruhlman mentioned that his fourth grader could make the dessert, so I put my then fourth grader to the test. And yes, they were that easy. This time around, my pro-lemon-bar-making-chef sixth grader mentored his fourth grader brother. The lemon bars were amazing. Make some today! And lastly, GIVEAWAY! The scoopage: several very kind and generous manufacturers sent the CK Dream Team huge amounts of scrapbook goodies. It's been like Christmas every other day. Alas, I'm only one person and I can't use it all (plus I'm afraid a potential house buyer will open my craft closet and think I have a serious shopping addiction, which I may or may not have, but I'm not going to talk about it today.) So I'm sharing my bounty with you! I've filled two USPS Priority boxes with stuff. Tons of stuff. They are packed to the very top. It's totally random, so please forgive me. I should have taken photos of the content, but uh, I didn't think about that until they were filled, and then I was too lazy to take it all out. But as you can kinda see, there are: mists, Thickers, adhesives, tons of patterned papers, bling-y things, stickers, chipboard, the works. New stuff. You are going to like this. I have two boxes for two lucky people. You have until next Tuesday, December 7 to leave me a comment. Sorry, dear friends living in other countries, these are heavy suckers, so I can't send them abroad. Please check back on Wednesday to see if you are a winner. With that said, I gotta go polish my appliances. I'll never buy stainless steel stuff again. Hello hello! I didn't do a Weekend In Photos this weekend. Sorry. Alas, I didn't break out my phone camera once. The reason is that we are moving to Los Angeles. The realtors came over, freaked out over our house (which I took as sign that they loved it. I hope.) and want to put it up for sale immediately. Which means, I've spent the past few days running around like a headless chicken (and looking that poorly also.) And will continue to run around headless for a few more weeks. It's been chaotic and nerve-jangling. But life moves on. And yesterday, as I was getting the littlest ready for school, I realized we had forgotten to make his turkey project, due, uh, yesterday (of course.) Luckily, middlest was home and he's a crafty one (in more than one way!) So the three of us worked together and made this adorable gobbler. We got to school and found out that we were the only people who remembered to turn in the project. So typical. 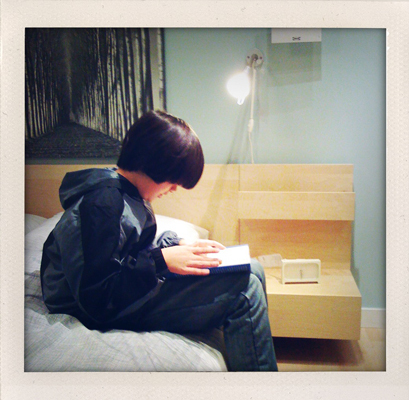 After everyone got home, we went to IKEA to get some decorative stuff for staging the house. And of course, the kids wanted to eat some meatballsgravylingonberrysaucemashedpotatoes. I'm so glad we did eat there, because this girl dressed up in the best 80s outfit showed up. Yes, I shot a photo. It needed to be recorded and shared. Tight, shiny red pants. Baggy purple shirt with huge shoulder pads. High tops. And a headband! Priceless. I was in awe and love with the getup. I miss the 80s. So I leave you with those lovely images, and I'm off to do more work on the house. I probably won't be here much for the next week or so, but I do have lots of scrappy goodies to giveaway when I return. So see you soon. Chinese checkers. Kind of hard to play if one can't read Chinese. I can't play it. Not sure what this is. A basket of cheap, fake hair? Blonde? In Chinatown? No idea what's printed on this plate, but it's beautiful. We Asians dig our jarred, canned, and packaged foods. Love the store signs in Chinese. Again, I can't read Chinese. Happy with my boba and new haircut. What did you say? My hair looks exactly the same? It's a bit shorter. Really. Really! Hello hello! I meant to do this earlier in the day, but uh, I forgot. Sorry! I had help picking the winners from my little imp. He folded the little pieces of paper, and picked the names. Good, helpful imp. Oh, his wrist looks gigantic from this angle. Kinda creepy. Thanks for the giveaway I would love the journaling book since that is how I waste so much time trying to journal my pages. Congrats on being selected to the Dream Team! 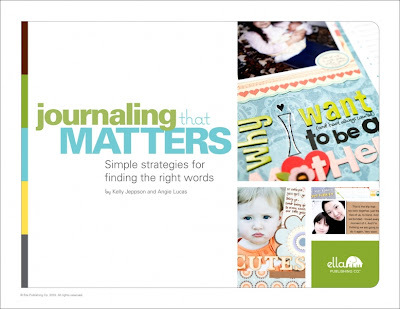 I would love to have a copy of the journaling book! Thank tou for the chance! Thanks for the opportunity for the books. I have 2 boys and would love the scrapbooking for boys book! Winners, please email me by using the Email Me button on the left. Thanks everyone for playing along! Hope you are having a great weekend. Thank you! For all the love. Here, via Facebook, Twitter, emails, comments at the CK blog and Club CK. Y'all sure know how to make a girl feel special. I wish I could email each of you individually, but uh, I can't. Blogger, get with the program! My fellow Dream Teamer and friend Nicole Harper posted her first layout ever published by CK, and I thought I'd share mine. 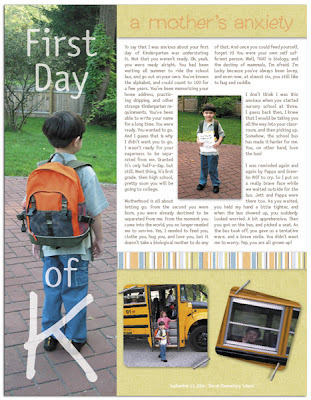 It was my very first layout published anywhere, and the very first one I submitted. So yes, I was super lucky. When an editor called me to ask for the layout, I freaked out, and could barely talk. Dork-a-rama. But they gave me another chance, woohoo, and here I am. I think it was for September 2006 issue? Maybe. Very surreal. Feeling so honored to be included in this year's Creating Keepsakes' Dream Team. Thanks for all the love! It really means a lot to me. ps: if you came by for the giveaway, there's still time! Find it here. I was imagining me, kinda like Paul Revere, riding through town yelling "GIVEAWAY! GIVEAWAY!" Yeah. Bad mental image. Sorry. 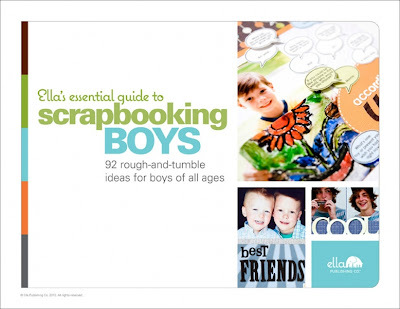 Ella's Essential Guide to Scrapbooking Boys. What a choice book. I wrote a bit about it here, and have some free downloads that I used for my layouts here. And then, the equally awesome Journaling That Matters book. What makes these books so great? My work is in them, of course! OK. Fine. Just kidding. What makes them great are the incredible layouts/ideas/tips inside each book. Stumped for what to write on your layout? Flip (in an e-flip sort of way) through the Journaling book, and you'll be de-stumped. Out of ideas on how to scrapbook manly pages? 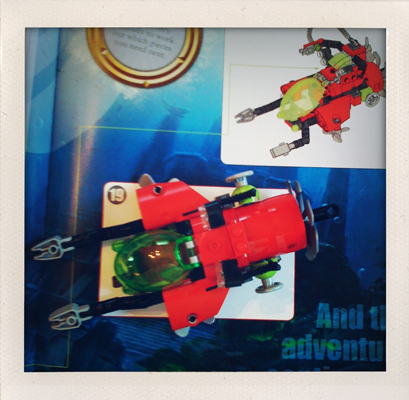 Check out the Boy book, and you'll find one that fits your needs. Pretty cool, eh? I have TWO (yes, 2) copies of the Journaling book, and TWO (2 again) copy of the Boy book to give away. Please leave me a comment saying which book you'd rather have (or if you don't care because you just want a book, ANY book), and I'll pick four winners on Friday. Because that's a good way to end the week. Good luck! eta: I'll pick a winner Friday night, and post it Saturday. I've closed the comments now (5:37PM ET). I'm running around like crazy today, but I'll be back in a few hours to pick a winner! 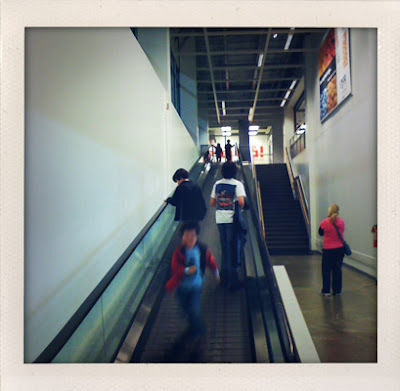 Halloween aside, we spent this weekend roaming the aisles of Home Depot, Costco, and IKEA. Good stuff. At Costco, pre-hot dogs and giant stash of toilet paper. 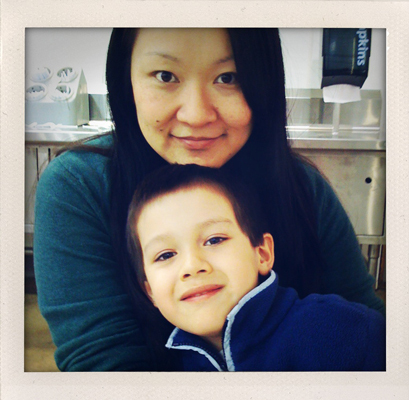 At IKEA, making ourselves at home. At least, we did not take naps. 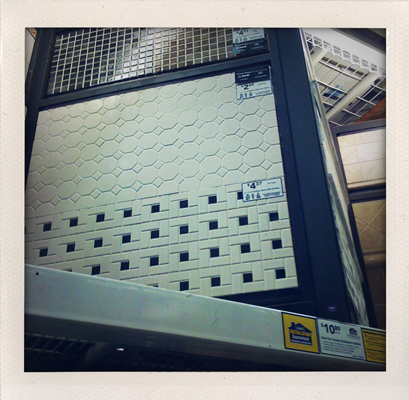 More IKEA. We call this exercise. Yes, we are those parents. Home Depot tile section. So confusing. So lacking in help. The kids did take some time off from our amazingly fun weekend to play with the stuff left by the Great Pumpkin (in exchange for their Halloween candy stash.) That GP, what a swell squash. BTW, I'm having a giveaway tomorrow! I have two different Ella books to give away. Do come back then.